Every night my iPhone sets itself in ‘Do Not Disturb’ mode. I always hated this feature because of the possibility of me missing an emergency call from a relative or something of that matter. I know you can turn that off on ‘Settings’, and obviously, I did. But, this iPhone Xs Max doesn’t seem to care about it and sets itself in ‘Do Not Disturb’ avery night. I hate this. 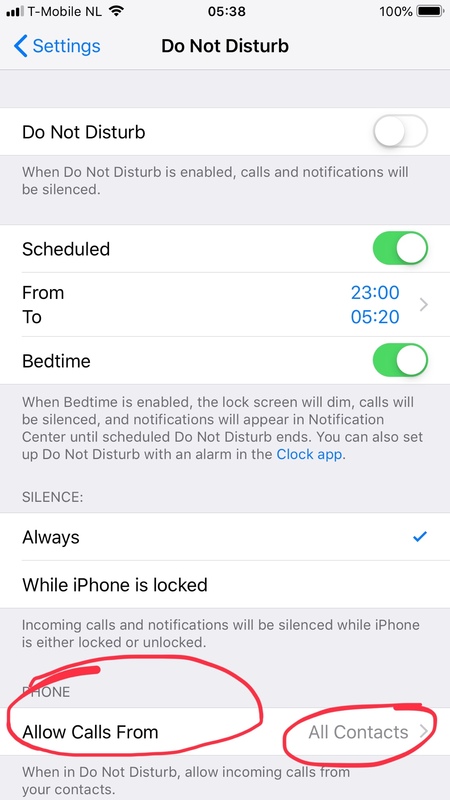 In Settings > Do Not Disturb, you can allow all calls to come through while DnD is enabled. Is the schedule disabled? That's probably what's turning it back on. You can also go to individual contacts and turn on emergency bypass for texts and/or calls. I have my wife and kids set up with emergency bypass for texts, so even if I am in dnd they come through. I appreciate yall’s responses, but these are just bypasses, which is letting me have what I want, without really fixing it. I would really like for the phone to stop setting itself in DND. Ever. Disable ‘Scheduled’ in DnD Settings. It seems this feature is gone? There is no more DND in contacts just “Hide Alerts.” I see no way to bypass for individual people anymore. Edit: Never mind found it. Who would have thought to look under ringtone of all places? Do you have scheduled DND turned on? I have DND turned off, like... in general! I believe you should mess with the schedule AFTER you enable DND. Why would I tweak the schedule if DND is off. My whole issue is that even DND being OFF, it turns itself ON at night. OH... just turn off scheduled DND in the DND settings and it won't turn on automatically anymore. Go to the Clock App and then bedtime and turn off DND there. If it is still coming on you have bedtime mode enabled and that turns on DND. I was asking if it was accidentally turned on. You don’t need DND switched to on for the schedule to kick in. It’s automatic which is why I asked. Just trying to help you find the problem. I would check “Bedtime” as a PP suggested. Also, try turning schedule on and see if Bedtime is checked under there. If it is, switch it off then switch “scheduled” back off. peetpan and Macgyver2008 like this. Man, yes. I found it! I never paid attention to the Options button on the top left.